I’ve found that lately, I’m trying to race through my projects so I can start something new. I suppose it’s my way of not getting bored with one project at a time, but that seems to be misfiring as I’m rather bored with all my projects. 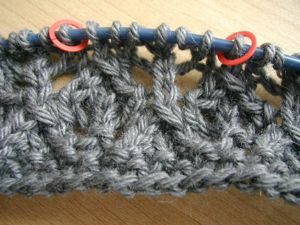 I need to just slow down, and enjoy the process of knitting, rather than trying to finish a bazillion sweaters before winter’s over. 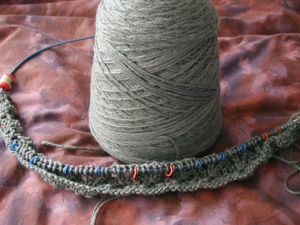 I’m using JaggerSpun Wool Silk 4/8, in Steel. It’s 50% merino and 50% tussah silk, and is just sooo soft and smooth. I’ve done one repeat (after I charted the lace pattern) and I’m just going to take it slow. A meditation project. 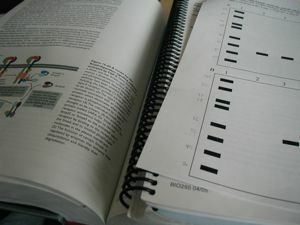 Now I gotta get back to this – five pages (including graphs), due tomorrow, and I haven’t written a word. Eep.